Today was an odd demo garden workday. We had a big thunderstorm at SIX-THIRTY A.M., thank you, and after waiting for the rain and waiting in the traffic I got to the garden about two hours later than usual, and then proceeded to run around like crazy trying to get all the tasks I’d scheduled done. 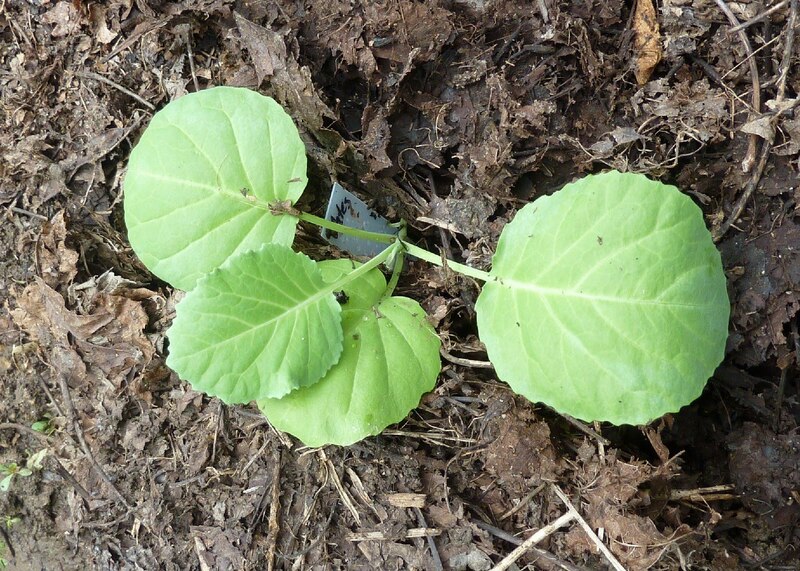 The most important was getting some kale, broccoli and collard seedlings in the ground. I find putting in fall crops in mid-August counterintuitive (it is still SO hot!) but in fact this is a little late for some of them (I despair of my still-tiny brussels sprouts). Most of the plants got row covers put over them, to help keep out the rabbits and the harlequin bugs, and shade the ground a little. My seedlings have been pampered under lights in the air-conditioned house, and I did not harden them off as HIGHLY recommended (is it still hardening off in the summer? Softening up?) because I know from experience that if I bring cabbage family seedlings outside, even to sit in trays on a shelf on my deck, some squirrel will decide that they are lunch. So I hope they do well in this first critical week. It looks like nature will be watering them, at least. which is today known as the Hampton Roads Agricultural Research and Extension Center of Virginia Tech. So there you are. I live in hope that someday I will (probably accidentally) come up with a new cultivar in the Montgomery County Master Gardeners Demonstration Garden, which can henceforth be known by the name Mocmagdeg. Collards are strongly associated with the Southern U.S. and African-American culture, but in fact they (along with the other brassicas or cabbage family members) are native to Asia Minor and the Mediterranean region, and have been grown in Europe for millennia. 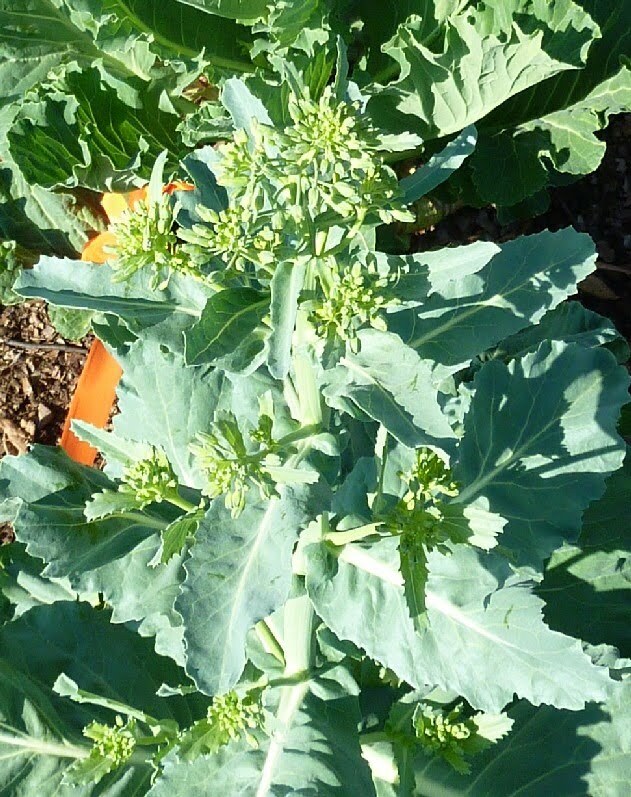 Julius Caesar ate collards! Collards and kale are two variations on the same plant, distinguished by leaf type, color and flavor. Both names come from Germanic or Anglo-Saxon words for cabbage. The various brassicas traveled with early European settlers to America, and when slaves were brought from Africa they adopted collards for their own gardens, as they could be grown easily with little time to spare, lasted through several seasons, and provided essential nutrients to an otherwise insufficient diet. Collards are very good for you, and can be prepared in lots of delicious ways. The leaves were a mite tough by then, but I enjoyed snacking on the flower buds, which not surprisingly tasted just like broccoli.